The Tender Trap had a drawing of a raccoon on the front of the menu, and its not the first place with racoon graphics where I have stopped in for a tenderloin. I get around Burlington often, and this place was near the top of my list for a recent visit. Location: 2222 Summer St in Burlington, Des Moines County, Southeast Iowa. Directions: Just fly in on your private jet because its right by the airport. Online at: Tender Trap used to have a website with a menu, pictures, and mail order but it isn't there anymore. The Tenderloin: The heart of the sandwich was a giant triangle of tenderized pork loin. It easily filled the takeout package it had been stuffed into. Interior meat was juicy. 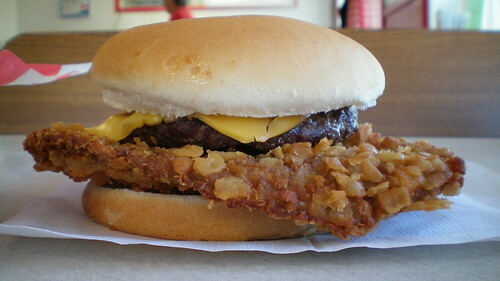 The crackermeal breading had been fried to a deep golden brown with great crunchiness and crumbs spreading everywhere. Served on a large toasted bun. Overall 8.2 out of ten. Price: I think it was $8.50 with two sides thrown in, but my notes are short so don't quote me on that one. Also on the menu: The menu is huge with the usual fried stuff, chicken tenderloin sandwiches, steaks and prime rib along with daily specials. The special sandwich is The Trapper made with chicken breast, ham, and bacon. Service: I ordered take-out from the bar the two times I stopped in. Nothing to complain about. Ambiance: This is a racing themed bar with booths, a bar, and a ton of space for seating. There is a serenity fountain tucked away in one corner, weird. Final Thoughts: This was better than the other tenderloins in the Burlington area I have already tried. It might take me a while to decide how it compares to restaurants further out in the Southeast Iowa region like Apron Strings in Mediapolis, Short Stop in New London, or the Hawkeye Restaurant in Keokuk.